Discover how, by making consumption more mindful, Smarties got its consumers to adopt healthier eating habits. Even when they are willing to have a healthier lifestyle, people don’t know what the “right” portion size is. Moreover, people who buy Smarties packs usually eat all the chocolates at once, often with the feeling that the pleasure is gone too fast. How can we encourage Smarties consumers to develop a more mindful consumption? How do we also get them to eat a smaller portion size without frustrating them and without forcing them to stop? Smarties is a responsible treat, and Nestle is willing to help its consumers make mindful decisions. Research has shown (Cornil et Chandon, 2014) that smaller quantities could deliver same or better level of satisfaction when tasted slowly in a mindful state. PRINCIPLE: Switching from mindless eating to mindful eating, introducing a decision point in the way the product is consumed. The decision point (Soman et al. 2010) makes the consumer unconsciously ask himself if he should stop eating or if he should continue. 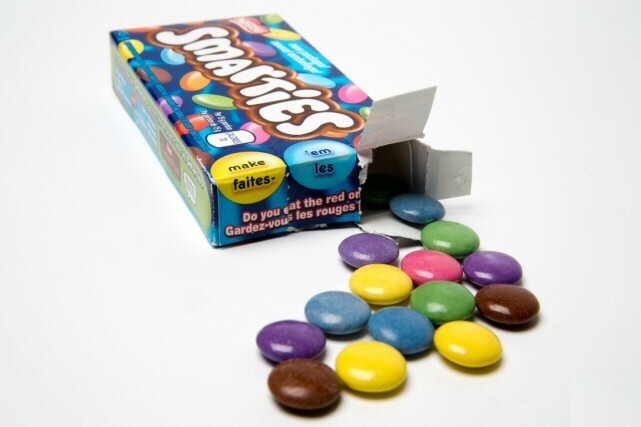 EXECUTION : The smarties are now divided into 3 equal portions of 15 pieces (70 calories) each. This suggests that the norm is to eat the smarties in 3 times, instead of 1 and implicitly tells the consumer what a better portion size is. LAB EVIDENCE : An academic experiment (Geier, Wansink et Rozin, 2012) concluded that people are eating less in total when they portion their treats, which induces a decrease in calorie consumption. FIELD EVIDENCE : The product has been tested in impulse buying stores. A post-launch survey indicated that compared to the standard product, consumers prefer this new pack and get more satisfaction from slower eating.